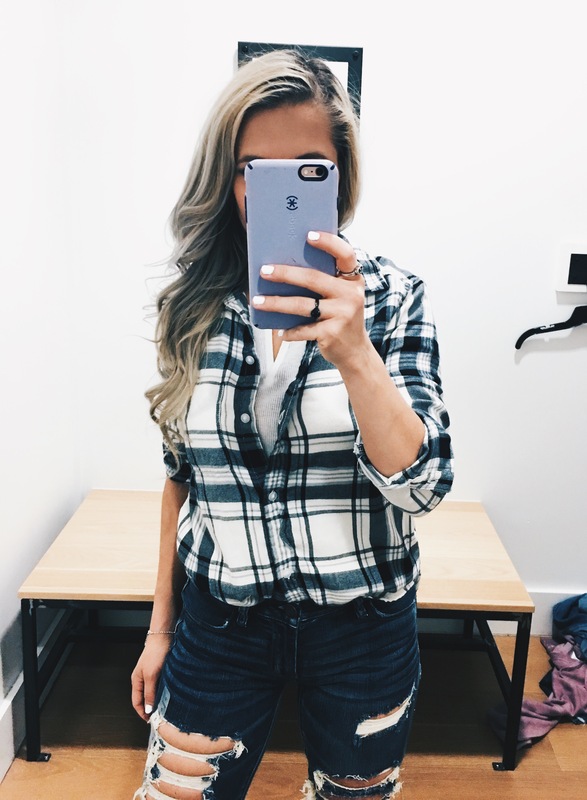 I’ll start this American Eagle Try On Fall 2018 with one of my favorite looks for fall: plaid. 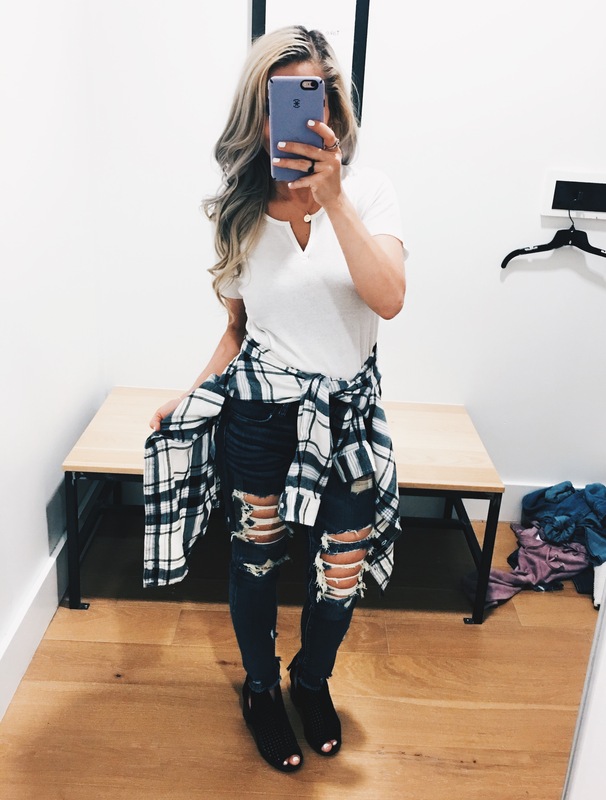 This plaid shirt comes in multiple colors–of course, I chose the black and white. The material is soft and lightweight, not flannel. 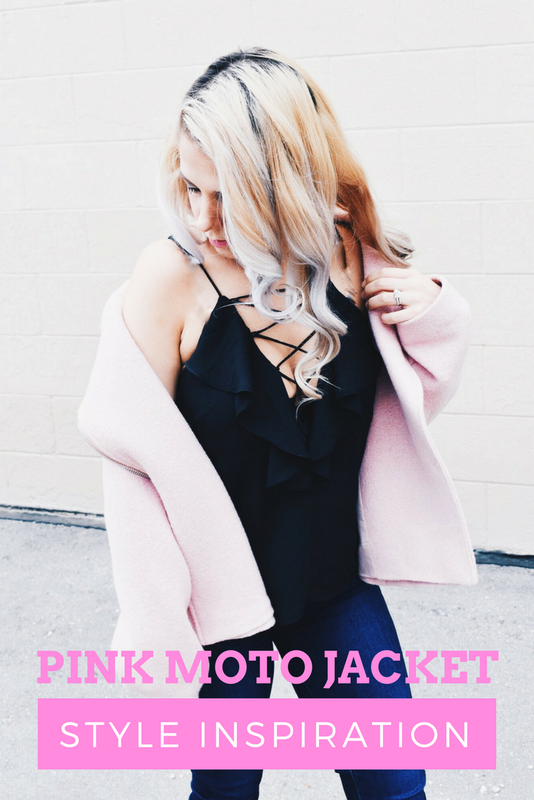 The lightweight material makes it a great transition piece to fall. And here it is worn another way. 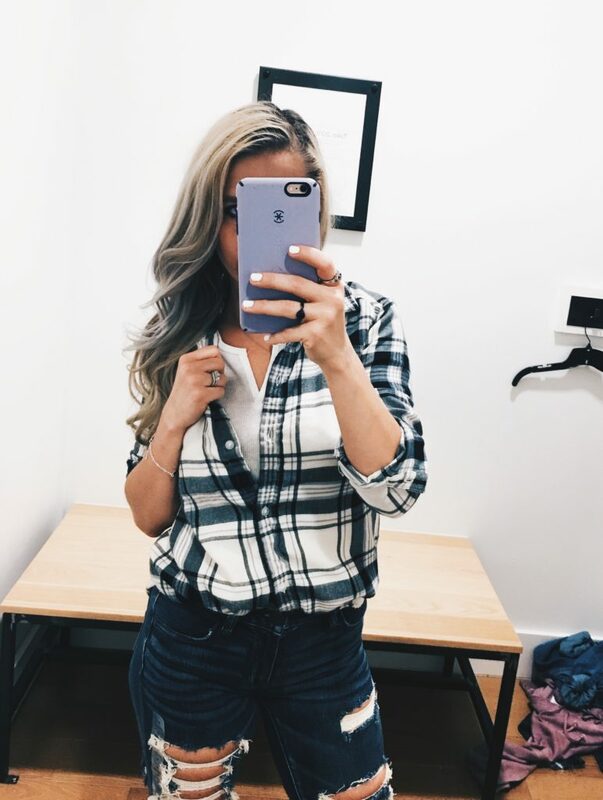 The black and white plaid looks so chic to me, like a city girl’s version of fall or something. I’m wearing this ribbed t-shirt underneath, which I chose for the notch neck design. It’s perfect to show off a favorite necklace, which, in my case, is the monogram pendant I’m always wearing. It was my push present with Colton! I also like how the ribbing takes a basic tee to the next level. 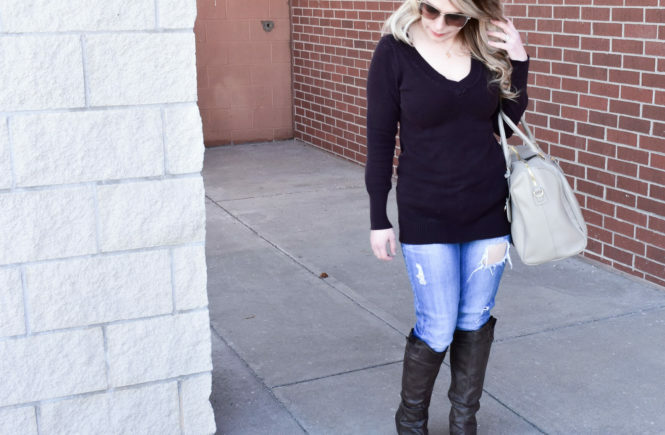 This is a perfect casual look to transition to fall. 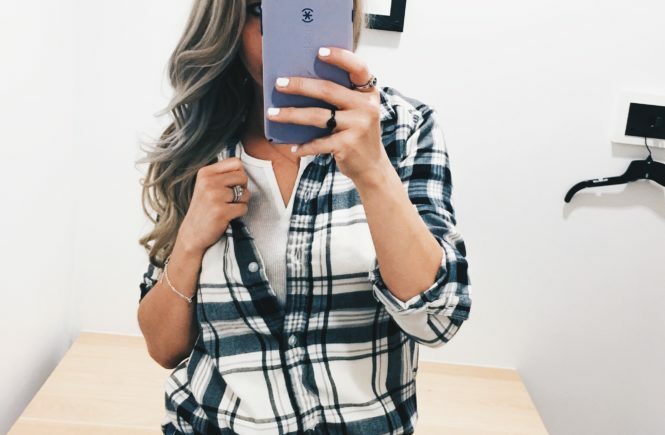 I’d wear this plaid shirt to the pumpkin patch, as I mistakenly wore a flannel one last year and… yeah, not a smart idea. Kansas is still really, really hot in September. You’d think I would’ve figured that out by now. Continuing with the black and white theme, here’s a beautiful rugby stripe sweater. 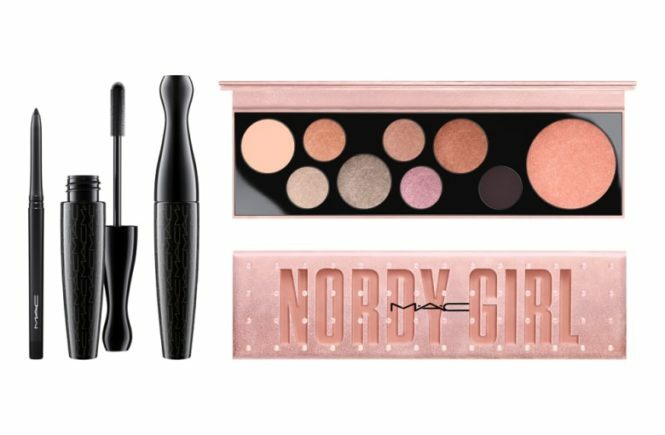 It’s available in a few different color combinations, too. 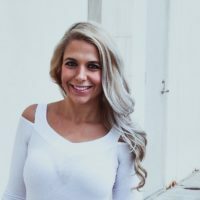 It’s not necessarily meant to be worn off-the-shoulder like this, but I always think that makes sweaters look a little more flirty. This is the second pair of jeans I tried on, and they are also super stretchy. In fact, I’m wearing a size down from my regular size here, which is a testament to the stretchiness of these. I’ll be honest, I didn’t think they had a prayer of fitting me when I picked them up, but I really liked this style and it was the only size even close to mine that was in stock, so I decided to give them a shot. I often hear to size up in AE jeans, but I feel like they run TTS due to the stretchiness. 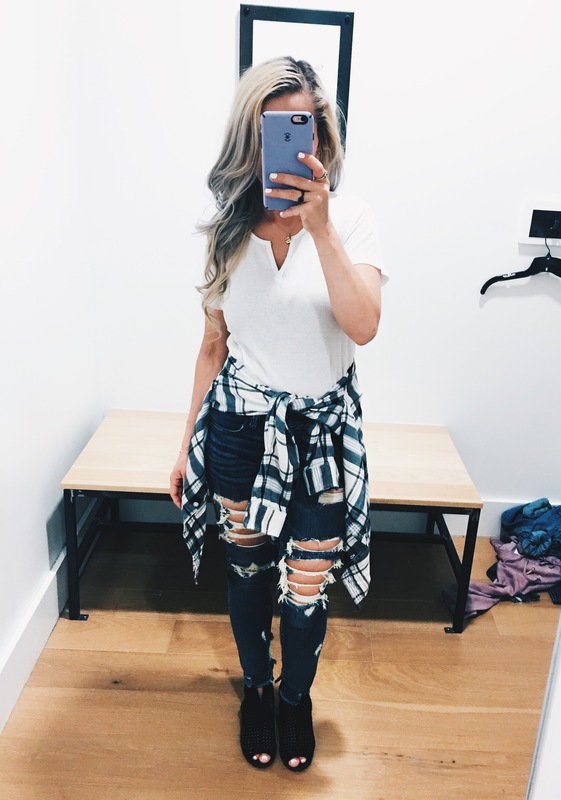 Plus, jeans always loosen up a bit as you wear them. I preferred this pair to the first because the majority of the distressing is reinforced, so you don’t actually see skin. I’m not opposed to showing a little skin, but I feel like this is a more flattering look on my legs. Especially during the winter when I get very, very pale. As in, Colton will literally call me a ghost. Ha! Here’s a better look at the distressing on these American Eagle jeans. There’s even some distressing near the ankle, which is unusual. 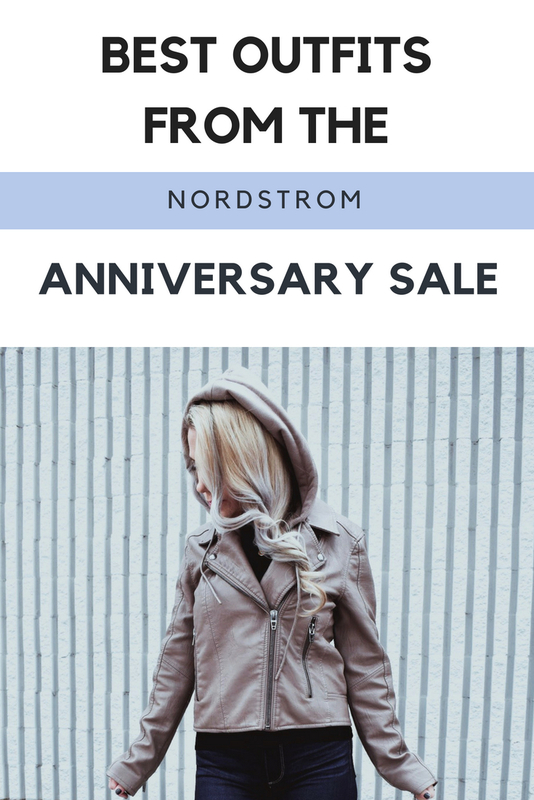 A great way to draw attention to a favorite pair of shoes or booties! And here’s the hoodie you need this fall. I love the girly lace-up detail and the gorgeous color. Purple is my favorite color, and ever since Colton found out, he brings me anything purple he finds around the house or points it out in a store. He really is the sweetest little shopping buddy [although don’t let that fool you, I definitely broke up my fair share of sibling fights during the time I was taking these photos!]. 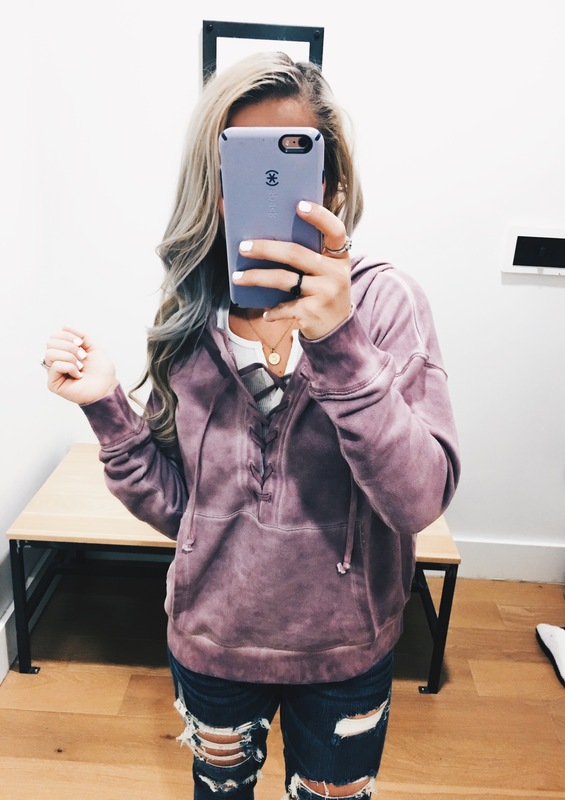 If you love girly hoodies as much as me, here’s another option with ties and here’s one that is just gorgeous. Both are half off and online only! 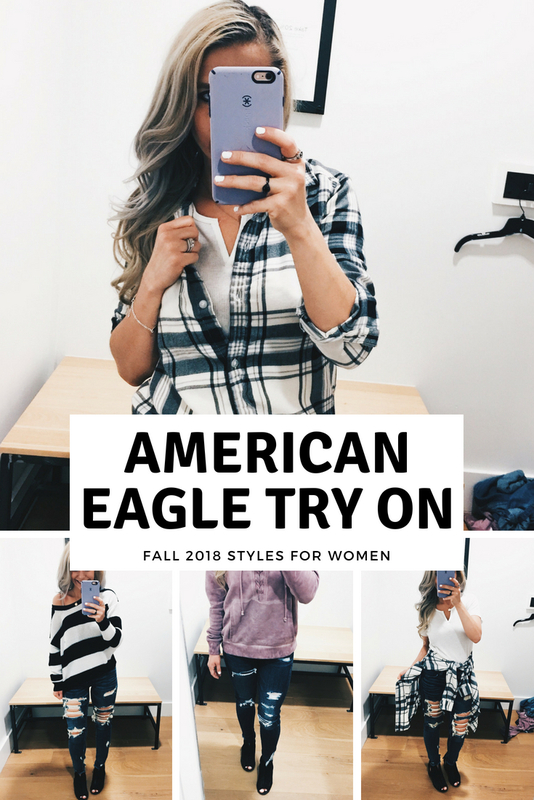 Pin this American Eagle Try On Fall 2018 for later! 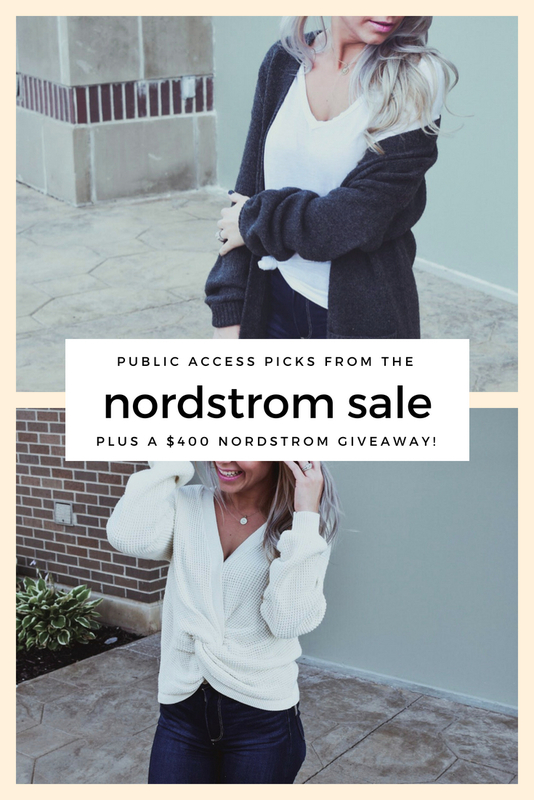 Need some ideas on what to spend that Nordstrom gift card on?